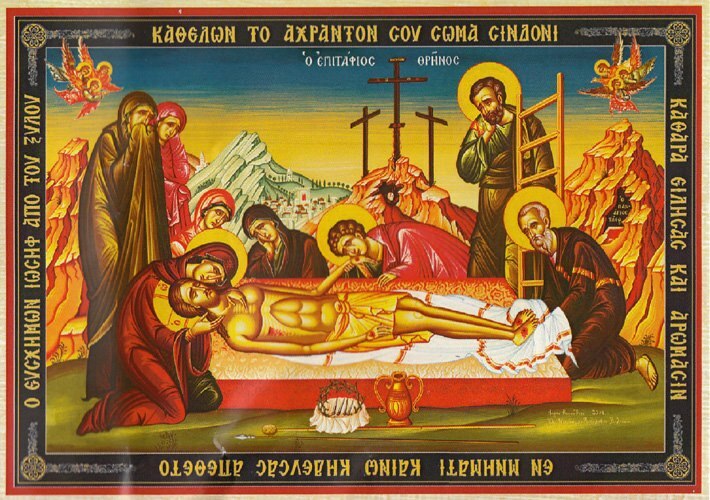 One of the most moving and beloved of Orthodox hymns are the Lamentations of Holy Saturday, usually chanted in churches on Great Friday evening before the Epitaphios. They are didactic and embody the joyful-sorrow of the solemn yet hopeful day. It is primarily a lamentation of the Mother of God, who stood at the foot of the Cross of her Son, as well as a lamentation of all Creation, for having crucified its Creator. In it are analyzed the Death, Burial and Descent into Hades of our Lord, God and Savior Jesus Christ. Specifically, the Lamentations are part of the Matins service for Holy Saturday, often called Praises (Eγκώμια) or Megalynaria (Mεγαλυνάρια), consisting of a long series of hymns, or troparia, divided into three stanzas, with each hymn introduced by a verse from Psalm 118 in the Septuagint. These funerary hymns are chanted in two tones which are known for being among the most solemn and triumphant. The Psalm itself is the longest in the Book of Psalms and divided into three stanzas, and in monastic rubrics is usually chanted during the Matins of every Saturday as well as every Funeral service. It is popularly known as the Amomos (Undefiled) Psalm, which comes from one of the first Greek words of the Psalm, "Blessed are the undefiled in the way, who walk in the Law of the Lord." Today most churches abolish the verses from the Psalm and only chant the troparia sequentially. Yet who wrote this most beloved of hymns? "In the current state of research we are not able to determine the identity of the poet of the Epitaphios. Perhaps the study of the hundreds of manuscripts which preserve the hymns known today, as well as those collections of megalynaria still unknown today, will lead us to the revelation of a name. We are unable to identify the poet of the Epitaphios with one of the known hymnographic scholars of the time, whose works are included in the hymnographic texts and are mostly archaic. The compositions of these hymnographers are very different from the style, language and aesthetics of the Epitaphios, which is a hymn characterized by its originality and its ability to come into direct contact with the faithful. The poet of the Epitaphios, unlike the other hymnographic scholars of the same era who usually borrow as much from ancient Greek literature as they do from the Fathers of the Church, seems to be particularly familiar with the hymns and the biblical readings of the sacred services." In other words, the author is unknown, and it seems it is not one of the more well known hymnographers of the Holy Week hymns, such as Andrew of Crete, Kosmas the Melodist, John of Damascus, Theophanes the Confessor, Theodore the Studite, Joseph the Hymnographer, and Mark the Monk. Perhaps one day, with more research, the poet will be made known to us.